During the days of July 27 - 29, the second Baoan Industry Development Expo was held at Shenzhen Convention and Exhibition Center. Amanbo, as a representative of the outstanding e-commerce enterprises in Baoan District, which booth attract many people to visit. During the days of July 27 - 29, the second Baoan Industry Development Expo was held at Shenzhen Convention and Exhibition Center. Amanbo, as a representative of the outstanding e-commerce enterprises in Baoan District, which booth was in the 1st Hall A2437-A2444. In the 3 days, many people came to Amanbo for watching the performances, visiting, consulting, and discussing business cooperation. Shenzhen TV, Baoan Daily and other media also made interviews with us. Baoan Industry Development Expo as the total impression and top event of Baoan industry development, which focused on showing the Baoan industrial development results, future planning, competitive industries and specialty products, to further show the image of Baoan Industrial Region. 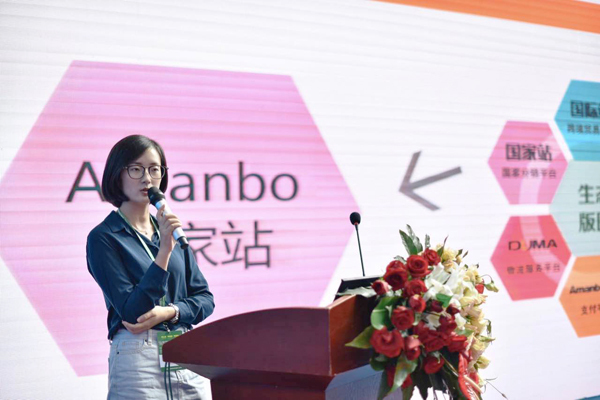 As the leader of the China-Africa e-commerce, the key project of the Ministry of Industry and Information Technology on China-Africa cooperation, this was the second time for Amanbo participated in the Baoan Industry Development Expo. It was also popular by the audience. At Amanbo booth, not only can the audience sit on the wood furniture to appreciate the African artisans’ talent, but also accompanied by the original atmosphere of the African drums to enjoy the authentic African dance performances, the more they can experience the musical charm of African drums by the guidance of Africa professionals. This was rare experience, of course to take photos! In the afternoon of July 28, Amanbo operating manager Wang Qian made a speech of "Your African ‘Shop’ - Amanbo National Station", introducing the good opportunity for doing business in African market, how does Amanbo national station help the domestic businessmen fast and accurate do business in African market. Based on 17 years of China-Africa trade base and 8 years of e-commerce accumulation, Amanbo since launched in 2015, the number of registered businesses has more than 120,000, and more than 300 daily growth rate. At present, Amanbo has built domestic operations centers in Shenzhen and Guangzhou, and set up CAhand China-Africa sustainable development center in Shenzhen, which has China-Africa maker, brand incubation, window of Africa, Chinese commodity exhibition hall and other services. Amanbo set up oversea operations centers, offline trade exhibition halls and local teams in many Africa countries, such as Cameroon, Kenya, Togo, Egypt, Niger, Sierra Leone, Cote d'Ivoire and other countries, its business scope has covered more than 30 African countries. With the DUMA logistics, overseas warehouse and other services continue to build and improve, the China-Africa e-commerce ecological system is gradually formed. With the background of " the Belt and Road Initiative", Africa, with 1.2 billion population of the blue sea market, the mystery has gradually been opened, China and Africa cooperation has shine. As a professional platform for China-Africa cross-border e-commerce, Amanbo is willing to work with all interested organizations, businesses and entrepreneurs to create a new blueprint for cross-border e-commerce!